Improving colt Accelerate (3c Lookin at Lucky x Issues, by Awesome Again) landed his first Black Type success in the $100,690 Shared Belief Stakes at Del Mar on Friday night. 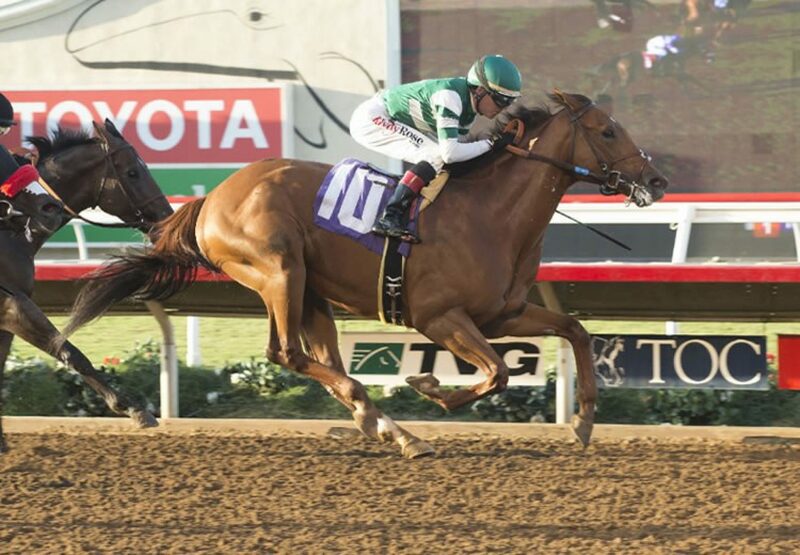 Trained by John Sadler, Accelerate gave notice of his potential when breaking his maiden by more than eight lengths on July 28. Accelerate turned in a tenacious effort to win the one mile contest by half a length, his overall record now two wins and two placings from five starts with prizemoney topping $116,000. A $380,000 Keeneland September purchase, Accelerate runs for Hronis Racing and was the most expensive yearling by his sire sold in 2014. A half-brother to stakes-winners Amarish and Daddy DT, Accelerate is from the good producing stakes-placed mare Issues. Accelerate is the 14th stakes winner for Champion Two and Three Year Old Lookin at Lucky.